Since we're coming up fast on Independence Day, it's a good time to mention The Veteran's Site: With one click of a mouse—and not a dime out of your own pocket—you can help feed homeless veterans, who are often forgotten in the flag-waving, bombs-bursting-in-air celebrations of the July 4th weekend. Also in the spirit of the weekend (and, in anticipation of the soon-to-be-released movie), I thought I’d offer up an edited version of an afterword I wrote for Robert G. Weiner's book Captain America and the Struggle of the Superhero: Critical Essays . Enjoy! 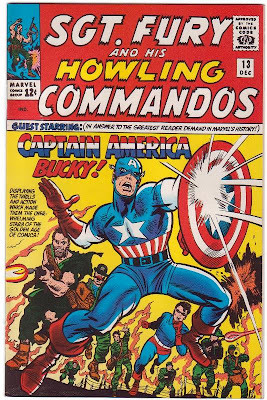 The first time I ever laid eyes on Captain America was on the cover of Sgt. Fury and his Howling Commandos #13. It’s a tribute to the character, and the man who drew that cover, Cap's co-creator Jack Kirby, that the image has remained lodged in my memory and imagination ever since. The Marvel covers of the era were—in contrast to their streamlined and sedate DC counterparts—gaudy and garish, crammed full of copy: simultaneously cheap, raw and incredibly vital. Cap’s costume—the stars and stripes, the fat A on his forehead—was equally garish, even by super hero standards; and the look in his eyes...well, the guy seemed a little crazy. I had no idea who Captain America was. Despite the fact that the cover copy proclaimed Cap and his young partner, Bucky, “the overwhelming stars of the Golden Age of Comics,” I’d never heard of them. Even the phrase “Golden Age” was new to me. To my ten year old mind, any comics that existed before I was born were as ancient and unfathomable as an Egyptian tomb. Which, of course, made the character seem bizarre and appealing. Add in that dynamic Kirby artwork, with Cap—in an impossible, but somehow believable, pose—dominating the scene, and I just had to read that story. Read it? I devoured it. Flash forward fifteen or so years. I’m brand new to the comic book business, having written a number of stories for the DC anthology titles, and just getting my foot in the door at Marvel Comics—where editor-in-chief Jim Shooter hands me an assignment. “There’s a new Captain America TV movie coming out,” he says, “and we want to do a tie in. 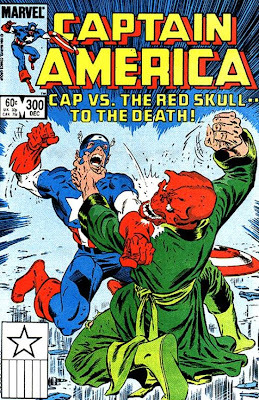 Come up with a story.” I’d seen the first Cap TV movie—let’s just say it was disappointing and leave it at that—but I dutifully set to work, weaving Cap, his long-time enemy, the Red Skull, and real life actor Reb Brown into a story that, I hoped, was more than just a cheesy TV cash-in. By the time I’d finished the plot outline, someone at Marvel came to his senses and Reb Brown was removed from the story, along with all references to the movie. I was told to rework the story as a three-parter for the monthly Cap comic, which I did: it finally saw print in Captain America #s 261—263. The story wasn’t a classic by any stretch of the imagination—in fact, the opening sequence, which featured Steve Rogers getting a little drunk with his buddies, was a major blunder—but it did get me a regular gig writing Cap’s adventures. (You can read this early effort, warts and all, in a brand new collection called Captain America vs. The Red Skull .) Working primarily with Mike Zeck—the starting point of a fruitful collaboration that would reach its peak seven years later with our Spider-Man saga Kraven’s Last Hunt —and British superstar Paul Neary (with some terrific fill-in work from the amazing Sal Buscema), I got to spend the next three years exploring the life, times and psyche of one of the great American icons. I’d been a loyal Captain America reader, of course—with a special fondness for the Lee-Kirby, Englehart, Gerber and Stern-Byrne eras—but I can’t say that Cap was a major god in my comic book pantheon: I enjoyed the stories immensely, but, to my mind, Cap was no Silver Surfer, Superman or Doctor Strange. Of course reading about a character and writing that character are two very different experiences—and the deeper I submerged myself in Steve Rogers’ world, the more I appreciated Captain America: not so much the icon as the man. In costume, Rogers was larger-than-life: “the whole country—squeezed into one pair of pants.” (That line, spoken about theater legend George M. Cohan, is from Yankee Doodle Dandy —one of the great movie musicals—and it describes Cap The Icon better than I ever could.) I was more intrigued by the person behind the mask. Rogers—to dip into movie lore once more—was the George Bailey of super heroes: a simple, honest man of inherent decency, who always struggled to do the right thing—no matter how difficult it was. He wasn’t concerned with ideologies or the politics of the moment. He was concerned with the American Dream. He believed, to the core of his being, in what America could be. Rogers was certainly well aware of the many times the United States had failed to live up to its own ideals—and those failures disheartened him—but he never gave up believing because his faith and hope weren’t invested in any elected official or political party. They were invested in the spiritual core of America: something deep and true and unchanging that lay beneath world affairs and shifting political currents. To my mind, Captain America’s greatest power wasn’t the strength he gained from the super-soldier formula: it was the depth of his compassion, his caring. His belief in the revolutionary power of simple human decency. The nature of the character dictated that the stories I wrote explored issues larger than the latest hero-villain slugfest. The canvas had to be huge—encompassing action, psychology and broader political, spiritual and philosophical issues. Some of my attempts failed spectacularly, some succeeded—but I thought I’d finally hit my stride during my last year on the book: an ongoing saga involving Captain America’s final battle with the Red Skull that was to reach its turning point with a double-sized Captain America #300 in which the Skull dies and Cap, after (at the time) forty-plus years of solving problems with his fists, begins to wonder if there’s another way to live his ideals and change the world. (Despite my love of the super hero genre, the inherent—and often mindless—violence in super hero comics has always disturbed me. This story was my way of attacking the issue head on.) In the proposal I presented to my editor—the late, great Mark Gruenwald—Cap was, ultimately, going to disavow violence as a tool for change—essentially rejecting the fundamental super hero mindset—and start working for world peace. (Keep in mind that this was at the height of the Reagan “evil empire”/cold war period, so it was a pretty radical idea for its day.) There was much more to the story—including Steve Rogers’ apparent assassination by his then-partner, Nomad, and the emergence of a new Captain America, a Native American named Jesse Black Crow—and I was eager to spend the next year exploring these challenging issues. Gruenwald approved my proposal, I wrote the double-sized Cap #300 then went ahead and plotted the next two or three stories in the arc; but Jim Shooter, hearing what we were planning, shot the idea down. Jim thought my idea violated Cap’s character, that Steve Rogers would never do the things I was suggesting. Captain America #300 was then cut down to a normal-sized issue and substantially rewritten, I think by Jim himself—or perhaps Gruenwald under Jim’s direction. (Which is why I used a fake name in the credits and immediately quit the book.) At the time I was angry but, in retrospect, I totally understand Shooter’s POV. Jim—a brilliant editor who really helped me along in the early days of my career—was the custodian of the Marvel Universe: he had to protect the characters as he understood them. Me? I think my Cap saga would have been an emotional and thought-provoking piece of pop fiction. My journey with Captain America ended then—but the character remains as fascinating as he seemed when I first glimpsed him on that Sgt. Fury cover more than forty years ago. Some people view Cap as an anachronism, a throwback to another era. Worse, some see him as a symbol of American Imperialism. They miss the point. Captain America, the costumed hero, is the embodiment of all that’s best and brightest in the concept of America: a concept that transcends the nation that birthed it. Steve Rogers, the man, represents everyone who seeks a better world for himself and his neighbors; who strives to live a decent, compassionate life. That makes him one of us—all of us, no matter our country of origin—and insures that the character will still be with us, in all his gaudy, vibrant glory, for decades to come. Something very much like that global "goodwill tour" you mention is an important part of THE LIFE AND TIMES OF SAVIOR 28. Although it doesn't turn out very well for S-28. I actually haven't read a CAP story in years, so I don't know what the "current spotlight" is. Just meant the attention the character's getting with the upcoming movie. I have quite a few Brubaker issues to catch up on, myself. Are you up on what they've done with the Skull's daughter you created? I know she's being used, but I have no idea what they're doing with her. That's a fascinating and really great story, J.M. Thanks for sharing it. Cap's always been a favourite of mine--yes, even a Canadian can love Captain America : ) . And all for the reasons you summed up at the end. I do see him, in personality, the opposite of Wolverine. Both fight the good fight, but their motivations, reasonings, personalities, ideals, are totally different. I love Wolverine, too, for being his own unique self, but Cap is more to my true ideals. When handled right, the writer, whoever he or she may be, gets the true essence of Cap. Doesn't seem to be that way much anymore, but maybe that's just me and the way I see it. Thanks again, J.M. You're welcome, A. Jaye. And thanks for sharing your insights. Thanks for this post. I've got nothing but love for the character Captain America. I don't think I ever had a chance to read your run (I was probably too young when it first came out) but that cover to #300 is just memorable to me for some reason. It's just a crazy image of two guys who hate each other trying to sock each other's faces off! I recently got the Life and Times of Savior 28 TPB and I think the intro of that book mentions something about how the genesis of the story began in your Captain America run. I've started reading Savior 28. I've read only the first two chapters so far. So far I'm really digging it. It feels like one of those stories where the big picture slowly gets revealed. Definitely adds a sense of gravitas to the plot. The art's really good, too. What other comics has the artist done, and how'd you decide to work with him on Savior 28? The only Captain America stories I've read are the ones by Brubaker. I haven't read the last 10 issues or so, but I read the first fifty of his run. It was outstanding. One of my favorite super hero runs (specially the first 42 issues). I loved Saviour 28. I really liked that you tried to explore peace in a superhero comic. Real world problems need more peaceful solutions and superheroes should do the same. Violence is the easiest (laziest) path and very likely to not be the best. Your comments on Captain America are about the most passionate and reasonable statements on the character's appeal that I've ever read. And your run with the great Mike Zeck is one of my favorite runs of any Marvel Comic. (Granted, by the time 1990 came around, I was for the most part done following monthly superhero comics). Your proposed final story arc for Cap sounds very intriguing. I have to say, I can see why Shooter rejected it. As you say, he has to think of the monthly commitment to maintain these characters and their status quo. You were approaching it as a creative person with something to say. I can see both sides, and probably the way the drama ended was the only way it could. No room for ego, that's for sure! Have a happy 4th of July, and thanks for your continued recollections here on your blog. Always insightful reading. Glad you're enjoying S-28, Dru. Check back in when you've reached the end and let me know your thoughts. S-28 illustrator Mike Cavallaro is part of the comics collective called ACTIVATE (check the links section on this page and then go discover a world of amazing online comics) and he's the writer and artist of the Eisner nominated graphic novel PARADE WITH FIREWORKS. Mike and I had been buddies for a while when he sent me some samples for a new project he was working on. I took one look and knew he was the guy who should be illustrating SAVIOR 28. It was almost as if the story had been waiting all those years for Mike to come along. I sent Mike's samples and my S-28 proposal off to IDW and we got the go ahead the same day...something that's never happened to me before or since! In the end, Javier, I think everything worked out for the best. In taking the Cap idea and transforming it into THE LIFE AND TIMES OF SAVIOR 28, I was free to create my own universe and tell my story exactly the way I wanted to tell it, without stepping on anybody's toes or dealing with editorial edicts. Okay, it took 25 years to get there...but sometimes we have to be patient! Very glad you enjoyed my run on CAPTAIN AMERICA. I'd love to see Marvel collect it one day. Sin has become, in effect, the new Red Skull (the original currently being bereft of a body), but without an ideology, just the pure desire to cause suffering in others. Given the questionable premise--that James "Bucky" Barnes survived World War II as a brainwashed Soviet super-assassin, but has been returned to his own mind now--the current run of Captain America has been surprisingly good. I would say Brubaker's stories owe more to your run of Cap than to any other writers', actually--you did more good work with Cap as a time-displaced man of World War II than anyone before or since. That's an interesting turn for the Skull's daughter -- who was called Mother Superior back when I created her (in retrospect, it's amazing we got away with that). I've heard lots of good things about Brubaker's Cap work. Sounds like Steve Rogers is in good hands. At any rate, it represents what I consider the defining quality of your run, which is Steve's interaction with HIS supporting cast, not Cap's. Stern got the ball rolling, but his run was cut short before Steve's civilian life was fully developed. Gruenwald dropped Steve's supporting cast in favor of his alter ego's, and that's been true of the title ever since. But to my mind, there's something that rings true about Steve hanging with a 'normal' crowd in his off hours. And to that end, I've always seen Bernie Rosenthal as his one true love. You're right that Roger Stern -- one of the best writers ever to work in the Marvel Universe -- got the ball rolling. I built on what he started. For me, Captain America without Steve Rogers was only a symbol, however powerful, and since my interest lies in what's behind the mask, I had to spend time developing Steve and his supporting cast. And, clearly, we're in agreement about Bernie. Love her. One of the things I played with during my run was the fact that Steve had surrounded himself with people who represented American diversity: Bernie was Jewish, Sam Wilson was African American, Arnie Roth (a character I brought in) was gay, etc. (It really drove the Red Skull nuts!) Since Cap represented all of America, I thought it was absolutely right. I think so. And it upped the stakes when Steve's personal and superhero life collided, too. I hope one day we'll get back to the idea of Steve hanging out with a civilian cast. What goes around, comes around. I'm sure it will happen. I finished reading Savior 28 last night and I gotta say that it was a satisfying superhero story. As I read it, I was thinking about this post on your blog and how it started as a Cap story. I could see certain aspects of how it could have been a great Cap story, but I think it works great with your own universe. It was a really fascinating read because I feel most of the comics of yours I've read (superhero or otherwise) tend to have very uplifting themes. S-28 is no exception. Maybe it's just me, but there were also large chunks of the story that I felt you were conveying a good amount of cynicism. (I loved how the narrator just casually comments, almost offhandedly, how the Lemurian and Shakti meet their fates.) That contrasted well with the hopefulness and idealism that ran throughout the rest of the story. It's a deep story, and fairly dense as well, for only five issues. The trade paperback has some nice art in the back and I liked seeing some of your script pages, too. That behind-the-scenes stuff just fascinates me. But, yup. This was definitely a comic book to be proud of making. I really liked it and I know it is something I'm going to revisit over the years, something that I think stands as steadfastly as any other venerable superhero comic. Oh yeah, and I just read the most recent Brubaker Captain America hardback, too. He brought Bernie Rosenthal into his story! Like I said earlier, though, I've never actually read your Cap so I don't remember her, or even if you would approve of his portrayal of the character. But it was nice that I've been following this thread because when I read Brubaker's comic, I was like, "Aha! I (sorta) know who she is!" Very glad you enjoyed S-28, Dru...and thanks for sharing your thoughts about it. As noted, it's a piece of work I'm extremely proud of. Happy to hear Bernie's back...y'know, unless she's a mind-controlled slave of the Red Skull! You were actually working on a Reb Brown project. Wow, that just boggles my mind. Now I have to admit that I didn't read the Captain America comics growing up. I was well aware of his status as a symbol but I never saw any aspect of his character that compelled me to know more. I'm wondering though did you run on Captain America ever get collected into graphic novel format? I'd like to see the Skull try it--Bernie would piledrive him, 80s wrestling style! Truth is, Eve, I was a newbie to comics when I wrote that story and incredibly grateful just to have the work...so I poured heart and soul into it, in all its incarnations. Aside from the current CAP VS. THE RED SKULL collection, which includes the story we're talking about, the only other story from that run that has ever been collected is a Cap-Deathlok three parter that Zeck and I did. I'd love to see the whole run collected. I'm especially proud of a story I did late in my tenure, that deepened the back story of the Red Skull and exposed more of the man beneath the scarlet face. Back in the day, David, we did a funny little backup story called "Bernie America" -- in which Bernie fantasizes about being Cap...and takes on the MoSkull (a mashup of the Red Skull and Modok). She was a pretty tough cookie; and, come to think of it, isn't it time we saw a FEMALE Captain America? Once the storyline wrapped up, Mark passed the torch to Mark Waid. As far as I know, not much has been done with Free Spirit. The story was really good though, and both Jesse Black Crow and Arnie Roth make appearances. I know Tom DeFalco introduced a female Cap to the MC2, American Dream, but I'm not really familiar with her. That's right: I'd forgotten about Tom's American Dream! But, even with that step in the right direction, I'd love to see a female Cap in the mainstream Marvel Universe. The time has come! Yeah, I'm agreed. Somehow the impact of the alternate universes isn't the same. You can kill the Ultimate Spider-Man a hundred times over, for instance, and it's not as big a story as Peter Parker's marriage being reversed in the mainstream MU. The only problem with a female Captain America is this... it isn't Steve Rogers. Alternate reality sure, but Steve is and always will be Cap. But personally I would love to see a Reality Where 'ol Sammy Wilson has takin' to shield tossing. I don't care what anyone says Sam Wilson is one of comicdom's most under used characters. And what's all this about Captain America being antiquated? If we have come to a point where compassion, justice, honor and a world where the meekest among us can have as much value as any, than perhaps it is time mankind threw in the towel. Luckily I don't for a moment believe it. Yes it is true I love old Cap. Okay so the surfer doc Strange are a little higher on myu list and the F.F. are tied with him for the next spot, but considering all the costumed cronies running around that's a pretty high ranking spot. And I'm sorry to disagree with you sir, but Cap not as good as Superman, I don't think Clark can hold a candle to our pure-hearted patriot. Then again the only Superman character I ever really love was Pa Kent (weird huh?). Cap is an oddity though pure like Superman , but completely un-naive in the evil's men are cap[able of like batman, almost like a mixing of the two. However Cap with this upcoming movie I think that it is important to point out that Cap has been a bit unfairly treated over he years, what with people often comparing his origin to the views of the very evil thought. When in actuality the Nazi's never would have given such a serum to Steve rogers, they would have viewed him as an inferior test subject physically and there for a waste and psychologically a traitor and fool. Truly these accusations are nothing but shock writing and prejudice in implying and in one case outright saying that anyone who's German would have Nazi sharing views. After all Reinstein id a Jewish name, but that was retconed to Erskine a predominantly non-jewish German name, and completely disregarding the fact that only 1/3 of the German people voted for Hitler, and that was just fear of Communists, with even most of those people disagreeing with his views. It's as infuriatingly inaccurate and poorly thought out as Michael Chabon saying on national television superheroes where the essence of fascism, when in actuality anonymously reacting to a crime, only using violence when necessary, not claiming an award and only dashing off to exert force when someone else is in trouble is the antithesis of Fascism. Sorry, to rant, but that type of psuedo-intellectual-talking-just-to hear-your-own-voice nonsense is a pet peeve of mine. P.S. you should be glad your last story was torpedoed, S-28 was great and Savior was a great character we never would have seen otherwise, especially since he was so different from Cap. Also, wasn't there some issue with Arnie Roth way back when? well, liked him. Thanks for sharing your thoughts, Jack. Given your wonderfully mixed ancestry, maybe YOU should be Captain America! The issue with Arnie Roth, as I recall, was that the Powers That Be objected to a scene (during the big Red Skull epic that ended my run) where I made it very clear (even though it was already hard to miss) that Arnie was gay. A page or two of the story was rewritten by Other Hands. But, as noted, it was still incredibly clear. Me Captain America? I'm not going to lie, I don't see me trying to make small-talk with Thor, and that's like half of the job. or all that paper work. As for Arne Roth, no it wasn't hard to miss ( especially since I read those issues as back issues when I was 18)however it also wasn't pounded down on you like too many stories of any number of mediums do these days, it was very realistic. But the thing I'll always remember about Arnie is when he told Cap to stop being so melodramatic, classic Marvel. And finally, don't talk to me about going to Baltimore, talk to the Red Cross. Seeing as how it's silly for Cap to yell "Avengers Assemble!" when he's working solo, he's needed his own catchphrase for a while. I don't know if Jack will ever BE Cap, but I'd pay for a comic where Steve Rogers battlecry was, "WISHING YOU NOTHING BUT GOODWILL AND HIPNESS FROM HERE TO THE STARS (AND STRIPES)!!" BTW, I thought it was funny this weekend that a kid saw me wearing a Mike Zeck Cap shirt and asked, "Where's his gun?" The times they are a'changin'--or looking at the early Cap comics, maybe what's old is just new again. Look at that SGT. FURY cover, David, and imagine Cap shouting: "WISHING YOU NOTHING BUT GOODWILL AND HIPNESS FROM HERE TO THE STARS (AND STRIPES)!!" Although it makes complete sense in a WW II context, the idea of Cap shooting people just seems...wrong. It is perfect, isn't it? And yes, while I'm not opposed to the occassional use of lethal force in life or fiction, I think superheroes should appeal to our highest ideals. I prefer heroes who inspire creative, life-affirming solutions to violent problems. In part I think it's sympomatic of the changing demographics. When I was reading comics, they were aimed at the intelligent ten year old. For the most part, that meant that characters didn't kill. Even Wolverine spent more time threatening lethal force that using it, and he was always struggling AGAINST his violent impulses. We live in interesting times, with superheroes becoming more and more mainstream via film. It's a good time to stop and consider what kind of messages we want to send to the kids watching. We're in complete agreement, David. Very well said! On that note, I highly recommend the television show BURN NOTICE, which is about an ex-spy who finds creative solutions to get people out of trouble. Sorry your July 3rd comment just got posted, Quique: I JUST discovered it tucked away in a folder I rarely look at! Speaking of pacifist superheroes, I recently heard that Joe Casey did a short run on Superman where he had Supes disavow violence. I'll have to get my hands on that: sounds great!